Visits: 53574 persons viewed this recipe. 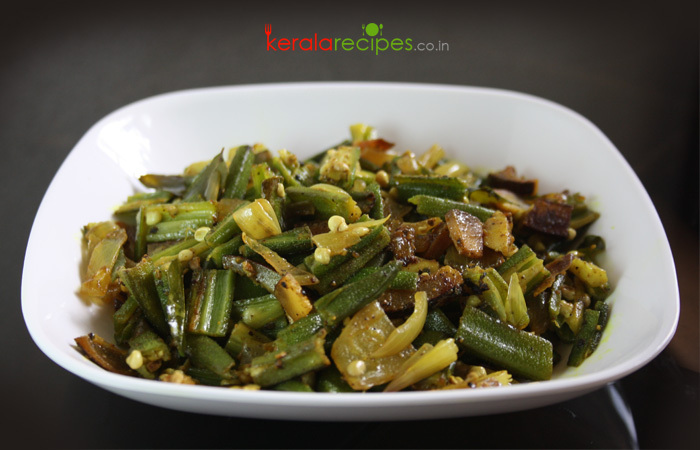 Vendakka Mezhukkupuratti (Okra stir fry) is a delicious side dish for rice. It is very simple and easy to prepare. This dry dish, ideally prepared with tender Okra, is usually served with rice along with other “wet” gravy dishes. Slice coconut and onion and keep aside. Heat 3 table spoon of coconut oil in a non-stick pan and put mustard seeds. When it splutters, to this add onion and coconut slices. Saute it till the onions turn golden brown. Put turmeric powder and ½ tea spoon black pepper powder into it and stir well. To this add Okra (Lady’s Finger), curry leaves and salt. Combine well and cook it covered (about 8 minutes) on low flame till done. Open the lid, add remaining ½ tea spoon pepper powder and cook it for 1-2 minutes to make it dry. Stir it occasionally. Taste for salt. Remove from the flame and transfer the vendakka mezhukkupuratti to the serving dish. If you are using a pan which is not a non-stick, add 2 table spoon water to avoid it from burning. For all these mezhukkupparatti no need to add water? Hi Karan, We need to add a little water for the mezhukkupuratties with tubers (കിഴങ്ങുകള്‍) as the major ingredients. If you are NOT preparing it in a non-stick pan you must add a little water for ALL mezhukkupuratties. Thanks a lot for this recipe. We made this for lunch today. I have never tried this with pepper powder before. It was really tasty! Nivedita, Thanks for the feedback. Great to know that the Vendakka Mezhukkupuratti came out well for you. Hope you will try other recipes too. Super recipe. Simple yet tasty. I avoided coconut, but still it came super tasty. 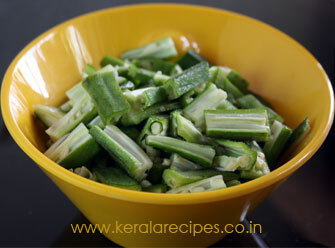 Good site to know about Kerala veg recipes, thank u, is there any dish by name ERUSERRY? How to do it. Pl post it. Jayaga, ‘Erussery’ is one of the traditional Kerala veg side dish usually served along with rice. I will try to include the recipe as early as possible. Thanks for the comment. Its super & simple, thank u. Can u include nadan crab roast receipe next time? Johnson, I will try to include it.